Young basketball prospect has a shot at the big time- college and beyond if he can just steer clear of his gambler father's ways. Predictable film about fathers and sons is more a game try then a slam dunk. 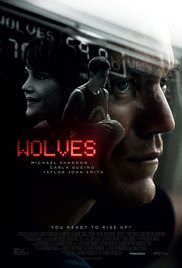 While far from being a bad film, WOLVES never fully soars except in fits and starts. If you must look anywhere look to the script which chugs along at speed but over predictable territory. Its good enough that one wishes it could have found it's own voice instead of mimicking so many other sports films. If there is a reason to see WOLVES it would be the cast which is top notch. There probably is no need to praise Michael Shannon who is once again at the top of his game. Taylor John Smith is also excellent as Shannon's son and basketball whiz. It makes the pain of his his life clear and we come to understand his choices. The rest of the cast is equally good and keep you interested even when the script doesn't hold your attention.